When the 360 launched with Geometry Wars on the Xbox Live Arcade, people were shocked at how much fun they could have with a $5 downloadable title. Not only were they shocked by the fun, but shocked that it had such high production values. So it came as no surprise that when Sony announced Super Stardust HD for their PlayStation Network, that the comparison immediately began to surface. Both games were dual analog shooters set in space with goals of besting your friends with a high score. Really though the comparisons ended there as StarDust shared a lot more in common with asteroids than it did with Geometry Wars. It also set itself apart by having a co-op mode. As soon as you launch onto your first planet in Super Stardust HD, you realize just how gorgeous the game is. And once you take that first shot into an asteroid and watch it explode into dozens of smaller chunks of rock, you realize you have something special in your hands. The goal of the game is simple - clear as many asteroids from around the planet as you can while avoiding enemies, flying rock, and eventually take out the boss. Certain asteroids are loaded with Kryptonite green color rocks that yield bonus points, weapon upgrades and more. Your weapons correspond to the type of rock you are taking out, so certain rock clears faster depending on the weapon you choose. Rock Crusher is good for normal asteroids, Ice Splitter works well on the frozen rocks and the Gold Melter is for...well melting gold. Co-Op is identical to the game's arcade mode with each player earning upgrades separately. Points and lives are a shared pool which makes teamwork and cooperation very important. On the later levels co-op works really well as a mix of different rock types are launched at you, players can specialize and pick up weapon upgrades of a certain type. If you thought the single player was chaotic, the co-op is twice as much. 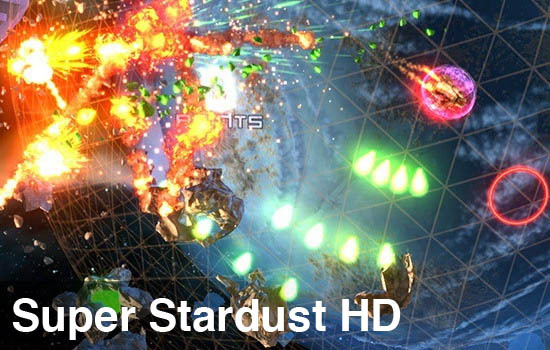 Sadly out of the virtual box, Super Stardust HD's co-op mode falls a bit short. The problem comes not so much in that the game changes things up, it comes from the camera. The core of SSHD revolves around speed and getting around the planet rather quickly by combining shots and boost. As you get to the edges of the planet the camera rotates and stays centered around your ship, in co-op mode it does not. If players are going in opposite directions, you'll be fighting the camera against each other and get stuck. I say out of the box co-op falls short, because there is a piece of DLC available that adds a handful of multiplayer versus modes as well as split screen co-op. In the end you'll pay $15 for this title to get the co-op experience you so desperately desire. At $15, I still think the game is worth that price. Beautiful graphics and effects, plenty of game modes, and lots of re-playability all make for a great overall package. If you're a sucker for high scores and pretty explosions, this is the game for you. 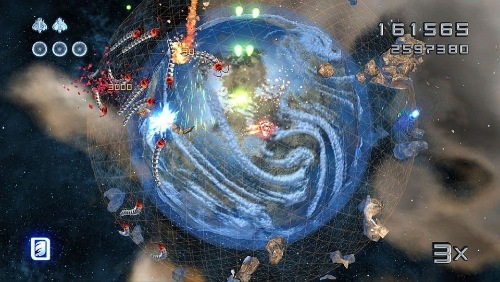 The Co-Op Experience: Team up wtih a friend to take out asteroids, enemies and bosses in this frantic shooter. Note: Splitscreen Play is only available via the "Team Expansion" pack on the PlayStation store. Page created in 1.6373 seconds.